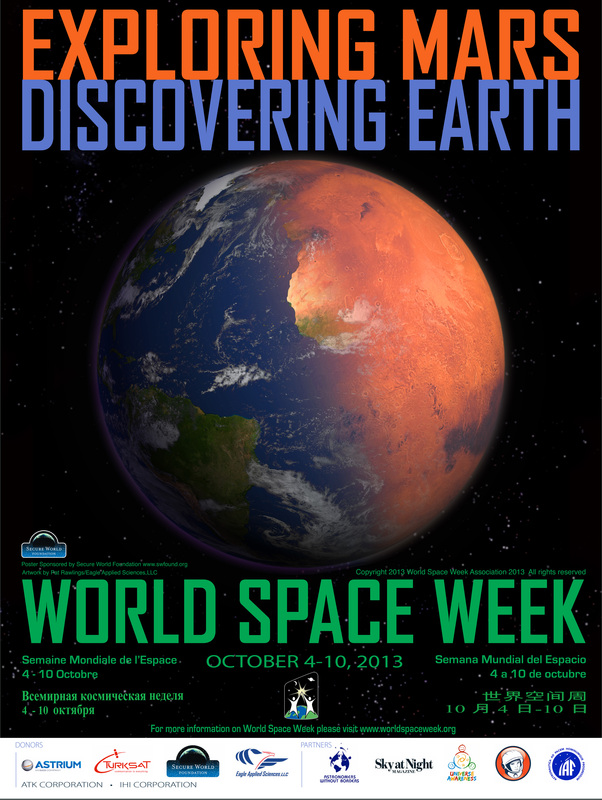 Today marks the start of World Space Week which runs from October 4-10. World Space Week is a yearly event to celebrate and promote the exploration of our solar system and beyond. The week is coordinated by the United Nations with the support of the World Space Week Association (WSWA). The start date (October 4, 1957) honors the anniversary of the launch of the world’s first artificial satellite, Sputnik 1. The end date (October 10, 1967) is to commemorate the Treaty on Principles Governing the Activities of States in the Exploration and Peaceful Uses of Outer Space, including the Moon and Other Celestial Bodies. This year’s theme is ‘Exploring Mars, Discovering Earth.” Here at Planet Four, with your help, we are exploring an alien process. The carbon dioxide geysers that appear at the Martian South Pole in Southern Spring and Summer have no Earthly counterpart. The prevailing winds blow the material uplifted by these geysers into dark fans and blotches seen from orbit on the ice sheet. For the past 4 Martian years, Mars Reconnaissance Orbiter and the HiRISE camera have been imaging the South Pole to explore the seasonal change. With your help marking the blotches and fans in the HiRISE images, we can tally the numbers of fans and blotches, measure their directions and sizes, and compare how these properties change over time in a single year as well as from year to year. With these measurements, we can better understand the processes that form the geysers and impact the Martian climate itself. By studying Mars’ climate we can better understand the similarities and differences between the sister planets. To celebrate World Space Week, the Planet Four team is hosting a live chat on Wednesday October 9th 6pm EDT/3pm PDT/11pm BST. We’ll be joined by Planet Four Science Team Members: K.-Michael Aye, Ganna (Anya) Portyankina, and Meg Schwamb . We’ll also be joined by special guests Kristin Block and Christian Schaller. Christian is a HiRISE Ground Data System Software Developer, and Kristin is a targeting specialist for the HiRISE camera. We’ll be discussing more about the Planet Four project, how HiRISE works, and the process from commanding HiRISE to the reduced images that you see on Planet Four. We’ll be posting a the video link on the blog in about half an hour. Hello all, i am currently looking into the Mars One project, and am finding it near enough impossible to find anything but crators and dark blemishes all over the planet, clear signs of air brushes and smoothing has been added everywhere (currently using google version of mars view). Can anyone direct me to a better site or app that can allow me to zoom in and out of Mars with undisturbed viewings?